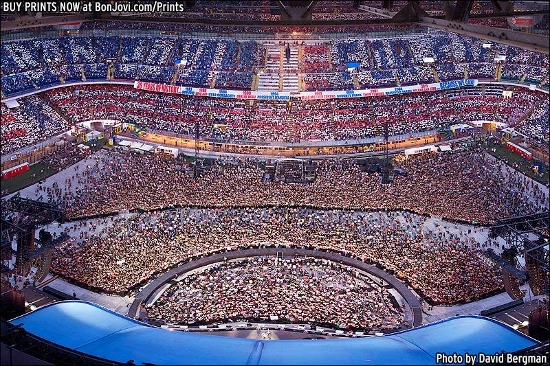 Check out this impressively choreographed tribute from the fans at Bon Jovi's Milan concert on June 29, 2013. Jon's attempts to get a significant proportion of the crowd singing "Because We Can" finally worked, too... although he managed to forget the lyrics himself and had to start the song again. Jon was, in his own words, "crying like a little girl" afterwards. Tour photographer David Bergman captured this panorama from the rafters. He didn't forget the lyrics, he was just overwhelmed and emotional and he choked. The last time this happened in Italy, Jon was really touched and happy. The fact that he choked up and was really emotional about it this time shows that he must have needed that special message of support. I am sure the Richie situation weighs on him even though obviously the band is doing a great job.